The 31st of May marks a year since Book Lover’s Market went live. A year of trying to let more light into our lives. And a year of selling books should be celebrated, right? Book Lover’s Market will be celebrating with poetry, stories and music at on the 2nd of June at 1pm and a great new venue out in Sunnyside, Pretoria called The Love House. Since Book Lover’s Market went online, it has dedicated itself to providing an online platform for independent publishers and self-published authors to sell their books. Book Lover’s Market carries books in different formats in order to cater for different tastes. The store offers paperbacks and eBooks in three formats pdf, mobi and epub to suit your various devices. And as the only South African online store focussed on independently produced books, Book Lover’s Market is set to fulfill it’s vision – here, lions tell their own story. “We want to help readers discover books that they wouldn’t necessarily find in the mainstream. This is why I say ‘here, the lion tells its own stories’,” says Duduzile Mabaso, founder of Book Lover’s Market. “The vision for this company directly tackles that old saying ‘until lions learn to speak, the tale of the hunt will be told by the hunter. '” The online bookstore aims to serve both the author/publisher and the reader. Speaking about the reader, Mabaso quotes 1Q84 author, Haruki Murakami who says ‘if you only read books that everyone is reading, you can only think what everyone else is thinking.’ “It is this kind of thinking that lies in the existence of a venture like Book Lover’s Market. Book Lover’s Market is positioning itself as the ultimate platform for Africa’s independent literature. As a platform that aims to introduce readers to new authors, new literatures. This intention can be shown by the kind of titles listed on Book Lover’s Market – from dual-texts like The Power of the Drum and Other Stories to Ga Ke Modisa by Sabata-mpho Mokae to New Frank Talk by Andile Mngxitama and The Setup by Segametsi Moumakwa and even the South African edition of Voices From My Clan as short story collection first published in Nigeria. The growing catalogue showcases the best of the as yet unknown and the soon to be known voices of Afrika. In addition to celebrating the 1st anniversary, Book Lover’s Market will also be launching Book Lover’s Hangout. This is a space for book lovers to meet, interact with each other and with the authors whose books they’ve come to love. The Book Lover’s Hangout is a community built on sharing, discovery and discussion of new literature. The Hangout is an online and offline place for readers to meet for author chats, book chats and signings. Join Book Lover’s Hangout here http://bookloversmarket.net/the-hangout and on Facebook. You are invited to an afternoon filled with poetry, good conversation and a jam session with Vangi Gantsho performing some of her great poetry as well as sitting down for a conversation about writing and performing. 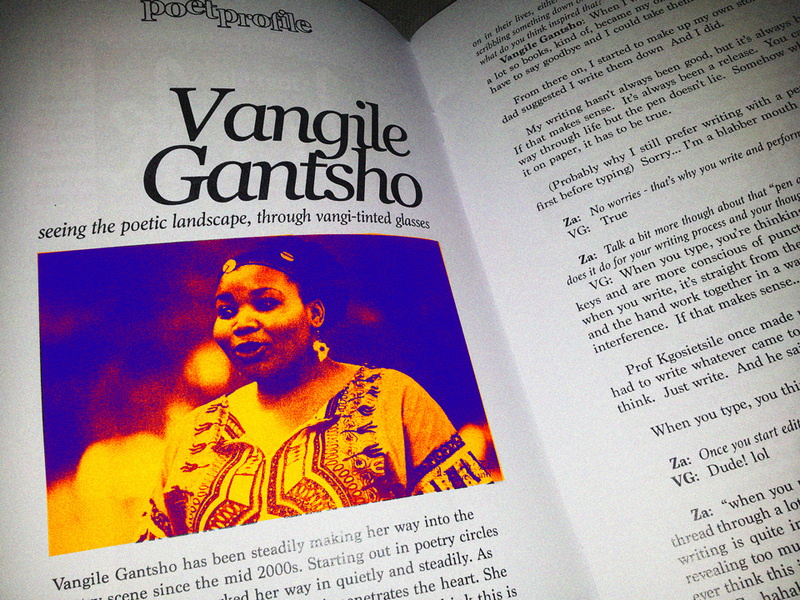 Vangi has been making waves in the poetry scene since the mid 2000s as a bold performer. She also founded poetry platforms like Revolutionary Words and No Camp Chairs Poetry Picnic (NCCPP).